First-year computer science students showcased their interactive and graphical projects after an intensive two-week coding bootcamp. 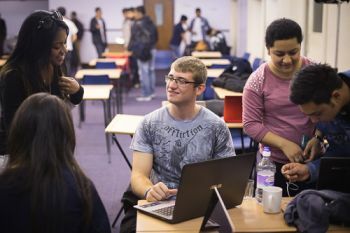 After an intensive two-week coding bootcamp as part of their 'Introduction to Programming' course, City University London's first-year computer science students got the opportunity to share the fruits of their creatively challenging work and were rewarded for it. On the 10th of October, they participated in a showcase of their interactive and graphical projects at the City Temple Conference Centre. The animated atmosphere created at the venue's large auditorium was infectious. 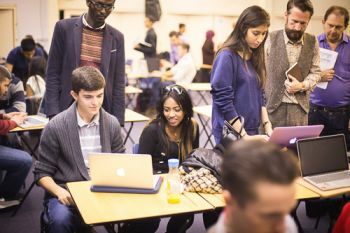 There were almost two hundred students huddled excitedly together over their laptops, sharing coding ideas and suggestions, with some of their dazzling displays beamed across the walls via overhead projectors. 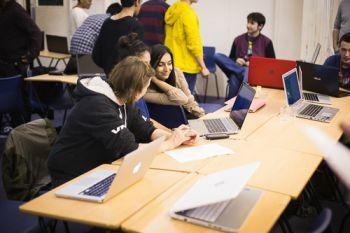 Using the programming language 'Processing' students created a wide variety of apps ranging from music visualisers to games to interactive artwork. Though the students began the course with very different levels of experience, they all succeeded in proudly creating projects which expanded their knowledge. Students were divided into seven groups (A to G). The winners were Khalil Wali (Group A); Chris Andrews (Group B); Arnas Sebeckis (Group C); Attila Brozik (Group D); Ferenc Schultesz (Group E); Alexander Hunt (Group F); and Andrea Schwendimann (Group G). Each of the group prize awardees were presented with an Amazon voucher and a certificate to recognise their outstanding achievements. "I found inspiration for my project with the Xbox Kinect which uses body movement to play and control games. In Space Capture, you control a paddle with face recognition to collect falling space debris that pulses to music. As soon as the time limit is reached, the game camera takes a photo of you to add to the leaderboard which adds a personal touch to every score." 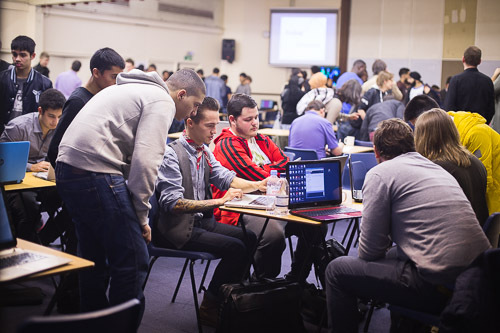 "This year's successful coding bootcamp showcase was an excellent follow up to last year's triumphant event. We consider coding to be a fundamental skill for anyone studying computer science and the standard of work demonstrated by the students was impressive. What is even more important is their enthusiasm and creativity, key qualities which will carry them through academic life at City and afterwards in their chosen careers. I wish to register my sincere thanks for the hard work put in and the gratifying results achieved by all of the staff and students involved." David Buckley won the overall Technical Prize (an Arduino starter kit) for his very well implemented Zombie game, while the Design Prize (a copy of Generative Design) went to Alex Hayward for his innovative 'Piano Hands' music visualiser.